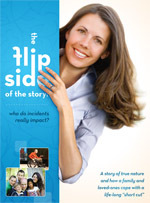 This is a 17-minute DVD in which Shondell, Chad’s wife, relates the story of that fateful day when Chad took a short cut and became paralyzed. Her down-to-earth approach is an authentic and accurate view of her feelings and her thoughts. The impact Chad’s split-second choices made that day affected literally thousands of people. Chad credits his success both personally and professionally to her love and support. This video can serve your company on many levels. It can be used in your orientation meetings, safety huddle meetings, safety toolbox meetings, as well as get-togethers to discuss safety and leadership principles. It comes with a powerpoint presentation as well as workbook for use in meetings.